Have you ever noticed how a particular flower scent can bring you back to your childhood? Perfume is such a powerful way of triggering memories of someone close to us or somewhere special we have been to. For me, the scent of roses instantly brings my much-loved grandmother into my mind - she grew them skilfully for so many years and one of the most precious pictures in my mind is of her snipping stems in the kitchen and arranging them in cut glass vases. This is just one of the ways that our gardens keep us in touch with people who are close to us. Sweet peas: These are an annual, grown from seed and lasting for one season only. They’re hungry plants and if you feed them well will reward you with masses of fabulous blooms. Keep cutting and / or deadheading as if you let them set seed, they consider their job done and turn up their toes. Roses: I find that many of the people I design gardens for are reluctant to include roses in their gardens because of the care they need, but by choosing the right variety and getting the surrounding planting right, you’d be surprised at how easy they are to grow. The queen of flowers can be grown as a bush, climbing plant or rambler. 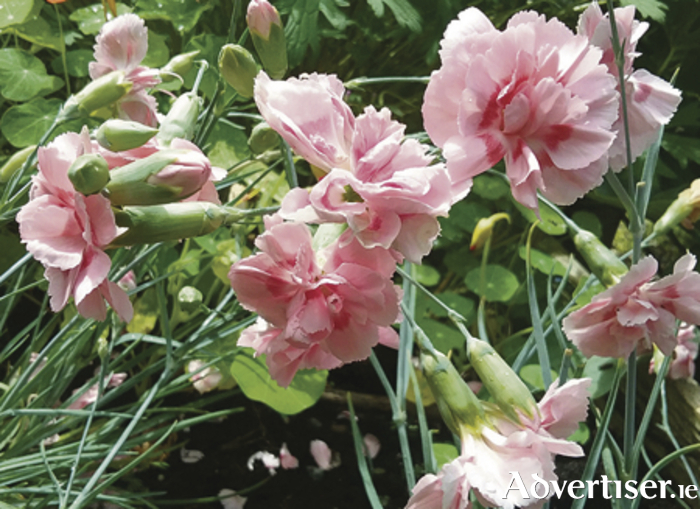 Carnations: These really need well drained soil to do well – add lots of grit or try them in a pot if you have heavy soil. Dianthus “Doris” has pink flowers and silvery stems and foliage, as well as a sweet, clove-like scent. Star Jasmine: Trachelospermum jasminoides or star jasmine is a lovely evergreen climber, with glossy green leaves that take on a reddish tinge in winter. In summer, clusters of white flowers are beautifully fragranced. Best on a south or west facing wall as it’s not completely frost hardy, but you can usually expect it to survive a typical west of Ireland mild winter. Try placing your scented plants where you are most likely to appreciate the fragrance. Near a seating area is always a good choice, or consider a border near your living room window to allow summer scents to drift through an open window on fine evenings.